Steering Column Details Application 1964 - 1974 GM A , F , X Body Levers Deluxe Knobs Deluxe Hub Heavy Duty Horn Button Improved Design Bushings Delron GM Internals YES Tube OD 2 Inch Rag Joint Eliminator Yes Diameter 2" Shroud Length 7.25" Main Shroud Length 3.5" Tapered Shroud Length 3.75" Column Length 32" Output Shaft 1.25" long 1" DD Steering Wheel Input 3/4 x 36" Spline Shroud to Wire Port 15.5 Service Grade 45E22 Finish Black Paintable Feature Includes Billet Turn Signal, Hazard. Feature Includes Prewired Turn Signal Switch Feature Includes Prewired Hazard Switch Feature GM Plug Feature Color Coded Wires Bushings Sealed Anti Rattle Bushing Grade. With over 75,000 square feet of OEM Style parts, restoration, suspension components and aftermarket accessories for your ride under one roof we got you covered. If it is stock, custom, old or new we got the parts for your ride! Custom Supply Warehouse has been owned and operated by the same family for over 50 years and we are proud to share our philosophy of offering large amounts of quality auto parts and accessories to select from at the best prices available PERIOD! In addition we offer expert technical advice along with our world famous customer service. If your looking for OEM, hot rod, restoration, or aftermarket parts for any type of vehicle, you will find it here! 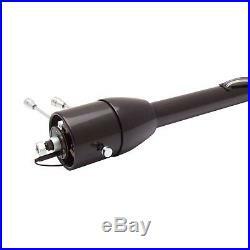 UNIVERSAL 32 BLACK TILT STEERING COLUMN FLOOR SHIFT NO KEY. Feature Includes Prewired Turn Signal Switch Feature Includes Prewired Hazard Switch Feature GM Plug Feature Color Coded Wires Bushings Sealed Anti Rattle Bushing Grade 5G Snap Rings Reinforced Turn Signal Arms Included Collar Anti-theft lock guard 5 Way Adjustable Tilt lever Canceling cam/self canceling turn signals, 4-way hazard switch Cover Anti-theft cover 3 7/8 OEM/GM-type wire plug This product was designed and engineered in the USA. As like all modern auto parts this steering column is manufactured from a variety of new parts from a variety suppliers around the globe. All parts meet or exceed OEM standards. Please note this steering column may not bolt in directly to your vehicle. You may need additional brackets and parts for installation. It is designed to meet modern standard and offers improved safety and performance to ensure maximum strength and adjustability. This is an upgraded aftermarket performance column that includes a 1 DD rag joint eliminator output shaft. This output shaft delivers better performance and safety over the oe rag joint. Depending on your installation you may require additional U-joints and steering shaft to mate to your vehicle. You may also need a steering shaft for your application. Depending on your vehicle, you may also need a steering wheel adapter. The wire harness is a standard GM style that is compatible with all major brands painless, Keep It Clean, EZ wire, American Autowire, etc wire panel systems. Stock photos may not be an exact representation of the item. Please read all product info, descriptions and terms before purchasing. All of your items fit in one box. The item "UNIVERSAL 32 BLACK TILT STEERING COLUMN FLOOR SHIFT NO KEY" is in sale since Thursday, November 30, 2017. This item is in the category "eBay Motors\Parts & Accessories\Car & Truck Parts\Suspension & Steering\Other".